Two former Rebels can play their own part in attempting to bring cup glory to the Somerset side this week as both Charles Wright and Paul Starke return for one night only. With a total of three riders missing for the KO Cup final against King's Lynn this week, Garry May has booked Starke for the second leg at King's Lynn whilst Wright, who left the club under a bit of storm in June returns to the Oaktree Arena on Wednesday (17th) night. May said "what happened with Charles earlier this season is now water under the bridge. We have both needed to move on from that and I know Charles is keen to do a job for us again. He has spoken to me since and even asked me once why I hadn't asked him back to guest for me. It was simply because the numbers wouldn't allow it, but here we are with a piece of silverware at our fingertips and the opportunity has presented itself for Charles to come in and do a job for us. I can't use him away but am delighted to have Paul Starke with us on Thursday. Both these riders can be meeting changers." Besides the absences of Bradley Wilson-Dean and Aaron Summers, the Rebels also have Jack Holder ruled out and last week May announced the coup that Chris Harris, the rider that ended the Rebels league championship aspirations with a breath-taking ride which will be a talking point for many a year, will stand in for both legs, with rider replacement in operation home and away. May added "Obviously you would have liked to have your own declared side in action for you every match but sadly, due to injuries and whatnot speedway doesn’t always work like that. But with Starkey and Wrighty back in Rebels clothing again and Bomber too, who I came very close to signing this season, I feel we have the next best." King's Lynn welcome back Dane Niels-Kristian Iversen who was forced to sit out their Championship play-off final last week but will still have key reserve Michael Palm-Toft missing due to the hand injury he sustained in the first leg of that competition and have called upon Tero Aarnio to cover. 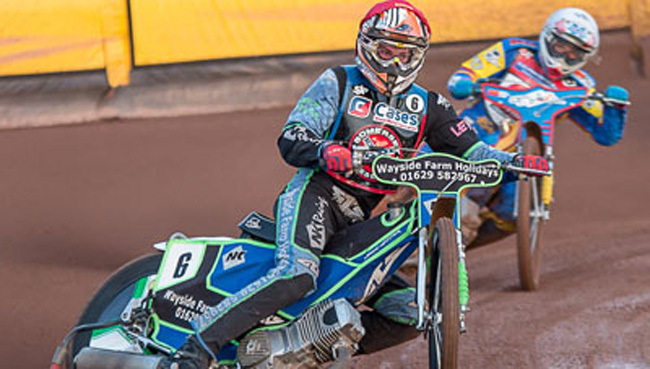 The Rebels will be looking to build a decent first leg advantage on Wednesday, for despite having won previously this season at the Adrian Flux Arena, the Rebels know that the King's Lynn Stars have been winning their home meetings by double figure margins since August.